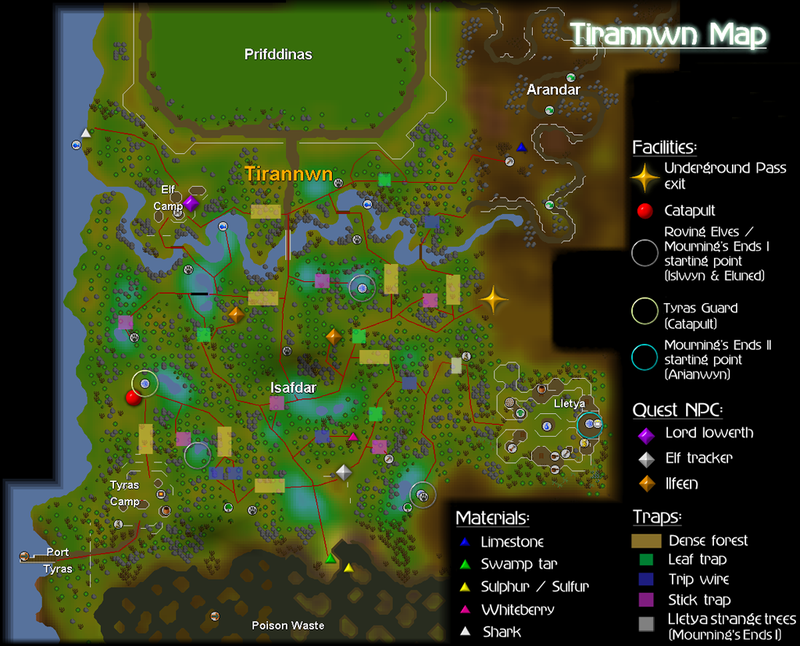 You'll need to enter Tirannwn before you can look for the elves. The simplest method in /v/scape is to start from Ardougne and then head north-west of Ardougne, running parallel to the walls of East and West Ardougne. You'll come across hills, keep going and eventually you'll find the gatepost for Arandar on a path running south. Past through and follow the path to reach Tirannwn. Once in Tirannwn, an easy spot to wait for Islwyn and Eluned is by the Tyras catapult to the north of the Tyras camp in the south-west of Tirannwn. The clearing to the south of the catapult, past a stick trap is easy to watch. They rotate their positions every few minutes, so wait until you see them and then speak to Islwyn. Having spoken to Islwyn, tell him the truth to start the quest. Offer to help, and then speak to Eluned. She'll ask you to get the consecration seed from Glarial's Tomb by Baxtorian Falls. Once she's told you this, you can safely leave. Note: Charter ships aren't available in /v/scape, neither are Fairy rings. You need to enter Glarial's Tomb with Glarial's pebble and defeat a Moss Giant within to get a consecration seed. This means you have to kill the Moss Giant without weapons, armour or runes. Since can use food and prayer, if you have 43 Prayer killing the Moss Giant is trival, just bring a few prayer potions and use Protect from Melee. If you lack 43 Prayer, you can try and tank with food such as Sharks, or attempt to get the Moss Giant stuck on the pillar within the tomb. Once the Moss Giant is stuck, run out and attack, and then run back to safety. Wait for the healthbar to disappear, and then repeat. This is safer than tanking, although it will take you longer. Once you have the consecration seed, you need to return to the elves in Tirannwn. Return to Tirannwn, and speak to Eluned. She will enchant your consecration seed, and tell you to head to the Waterfall Dungeon. Once she has done this, you can safely leave. Head to the Waterfall Dungeon, remember to bring a rope, a spade and Glarial's amulet. Make sure you have the key (called 'A key') to unlock the second door in the dungeon. If you don't, grab it from the crate in the eastern room. Head into the western room and past the Fire Giants and into the room with the chalice. Plant the seed with your spade and a crystal tree will appear. 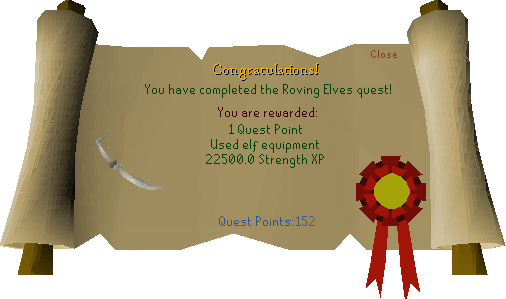 Return to Islwyn in Tirannwn and claim your reward. You can pick from either a Crystal Bow or a Crystal Shield, both starting at 2/10 charges.